Firefox owes much of its success to add-ons. There are thousands of third-party extensions and 1.5 million are downloaded every day. Firebug is an essential tool for web developers and I use around a dozen other add-ons which make life a little more bearable. Unfortunately, some unscrupulous software vendors have capitalized on Firefox’s extensions system. 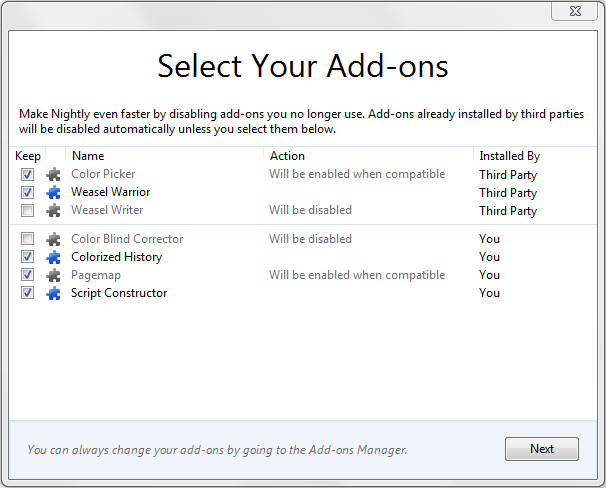 Third-party applications often bundle sneaky add-ons which are hidden within installation settings or installed without the user’s consent. Many vendors claim their add-on is a browsing enhancement (similarly, many will claim their OS boot-time processes aid the user’s experience). The fact remains that few of these add-ons are genuinely useful; many offer poor functionality, clutter the interface, hog memory and increase start-up times. It’s not only software from dubious vendors either. You’ll find add-ons hiding in products from Microsoft, Google, Yahoo, Oracle, Nokia, and most anti-virus companies. Several are Mozilla’s competitors — will those companies care if a Firefox add-on is rigorously tested, slow, unstable, or unreliable? In the worse cases, add-ons have an adverse effect on security, are rarely updated or prevent uninstallation. A confirmation dialog will summarize the user’s choices. We understand that there are legitimate use cases for some third-party add-on installations, and that those developers have done the right thing by asking users to opt in to the add-on, following our performance best practices, and providing a good user experience. 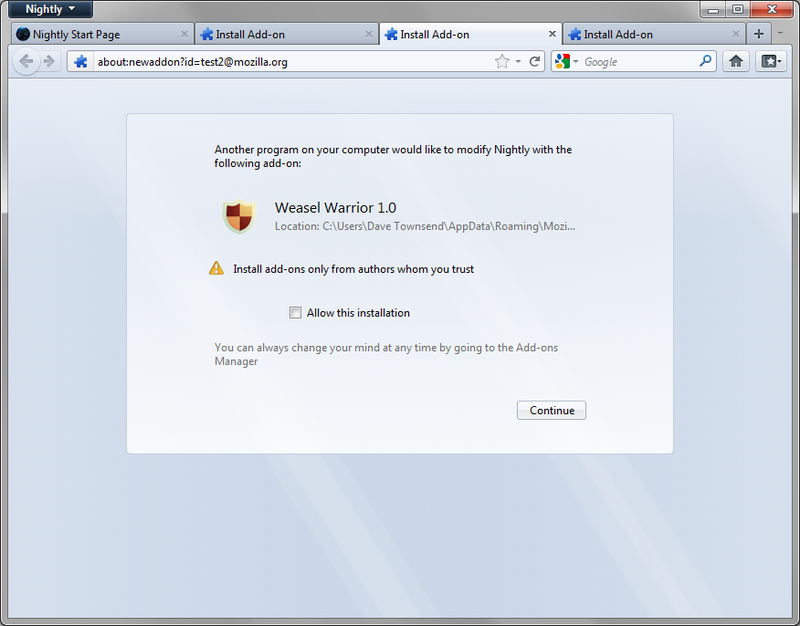 Unfortunately, the extent of unwanted add-ons installed through these methods has caused us to take action, but weâ€™re confident that users who truly want such add-ons to be installed will opt in when Firefox prompts them. It’s about time. To be fair, Mozilla could not have foreseen the success of add-ons or how they would be hijacked, but this feature should have been added years ago. Add-on blocking will appear in Firefox 8.0. 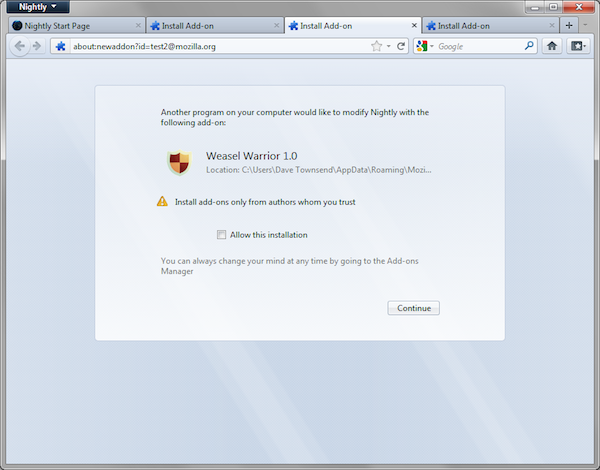 We’re only at version 5, but Mozilla’s rapid update schedule means it should appear during early 2012.